PezCycling News - What's Cool In Road Cycling : EUROTRASH Dumoulin Monday! Tom Dumoulin surprised everyone and himself in Sunday's stage 9 on the final climb to the Cumbre del Sol with his climbing form. He won the stage and took back the overall lead from Esteban Chaves, plus he showed all the top men his rear wheel. All the video, race reports, results and quotes from Spain and the GP Plouay. We also have rider contract news. Can Dumoulin win the Vuelta? 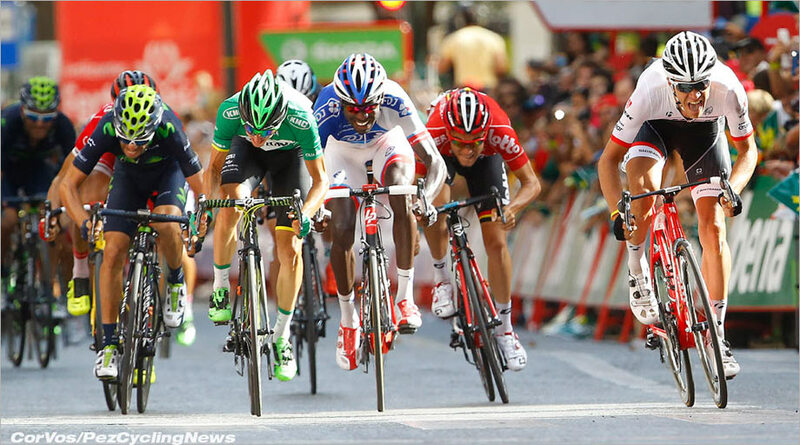 TOP STORY: Sagan and Motos! It was only three weeks ago that we saw Greg Van Avermaet knocked off by a race motorbike in the Clasica San Sebastián when it looked like he could win. On Saturday in stage 8 of the Vuelta there were a lot of crashes, it was a dangerous day in Murcia as you can see by who didn't finish. Peter Sagan was in the group that would contest the final sprint when a moto wiped away any chance of a win. Understandably, Sagan lost his temper, but he received a 300CHF fine for his outburst. The next day Sagan didn't start, the official reason being his injuries and they were bad: "suffered wounds and burns of first and second degree on the left side of his body, from the hip to the lower leg. In addition, he has a contusion on his left forearm with an intra-muscular hematoma. The team doctor, together with the sport directors at the Vuelta, decided that Sagan cannot safely continue the race with the injuries he suffered. As a result, he will fly back home as soon as possible." Maybe he could have raced on, but they way he has been treated by the commissar must have had a big effect on his mental state. Sagan is normally so happy and easy going, so for him to react as he did it must have been very serious. A rainbow jersey would cheer him up! A blistering attack in the final climb of Stage 6 to Sierra de Cazorla earned Esteban Chaves (Orica-GeenEDGE) the Vuelta leader's red jersey back after he had given it for a day to Dutchman Tom Dumoulin (Giant-Alpecin). The diminutive Colombian crowned a perfect week for his Orica-GreenEDGE team, handing them their third stage win in this Vuelta, his second personally, one day after the sprint won by Caleb Ewan. Dumoulin did not bow without a fight, the Dutchman bravely counterattacked in the finalé to take third place on the heels of Ireland's Dan Martin (Cannondale-Garmin). Behind them, all the GC favorites finished together. Australian Adam Hansen (Lotto Soudal), in his 13th successive grand Tour, was the first man to make a move after 4km but was pulled back three kilometers later. While the pace was nearing 50 kph, too fast for Matej Mohoric (Cannondale-Garmin), who called it quits, several attempts took place, one even involving green jersey holder Peter Sagan (Tinkoff-Saxo). The decisive move came after the first hour and included: Cyril Gautier (Europcar), Niki Terpstra (Etixx - Quick-Step), Kristijan Durasek (Lampre-Merida), Peter Velits (BMC) and Stephen Cummings (MTN-Qhubeka) and eventually Miguel Angel Rubiano (Colombia). Tom Dumoulin's Giant-Alpecin team maintained the gap at around four minutes. They were later joined by Movistar. While the gap kept going down, Gautier was first at the top of the 3rd cat. Alto de Baeza ahead of Rubiano and Drasek (144.5kms). At the sprint, won by Rubiano 15 km from the finish, the lead for the six had gone down to 1 minute. Sensing the break was doomed, Tour de France stage winner Cummings went on his own with 12 km to go. He was only caught on the final climb when he saw Chaves fly past like a rocket. Behind him, all the protagonists of Sunday's stage to Caminito del Rey were seen trying their luck (Dumoulin, Martin and Roche) while Alejandro Valverde (Movistar), Joaquim Rodriguez (Katusha), Chris Froome (Sky), Rafal Majka (Tinkoff-Saxo) and Nairo Quintana (Movistar) finished in that order in the top 10. Orica-GreenEDGE DS; Neil Stephens: "I thought he would wait for tomorrow. But he saw his team-mates had worked hard and he felt obliged to do well. That's the way he is. Esteban rides with the heart, not with the head. For now, he's doing well, but I don't know how far he can go. Maybe not on this Vuelta, but I believe he can become a great champion in the future. It's our young riders who win the stages, but if you look at the guys who do the hard work, they're the older ones. And the youngsters can take advantage of it." 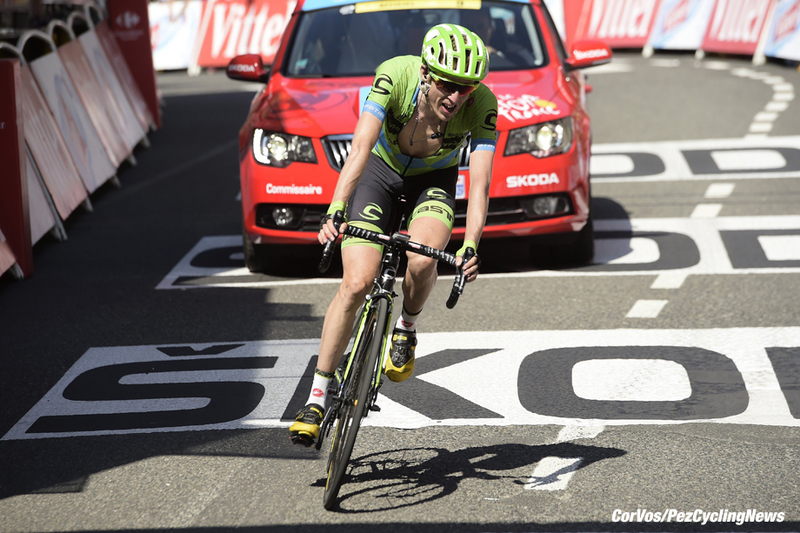 2nd on the stage, Dan Martin (Cannondale-Garmin): “It was a finish that suited me and from the start I felt good. I had a ridiculous number of bottles from the staff, keeping me well watered all day and I think I seem to race well in the heat. With hindsight, even though I did well on stage two, I wasn’t so great then, but now I just keep getting better and better. Esteban - God he was strong. He went away at the bottom and then when I went, there was a bit of a headwind so that was why I didn’t get a gap at first. I would never have caught Chaves. I’ve got no idea how far I can go. After 2013, this is really the first time that I’ve really gone for GC in the second Grand Tour of the year and it’s the second time I’ve done a second Grand Tour in the same year, too. So we could get to stage 11 or stage 15 and the wheels fall off." 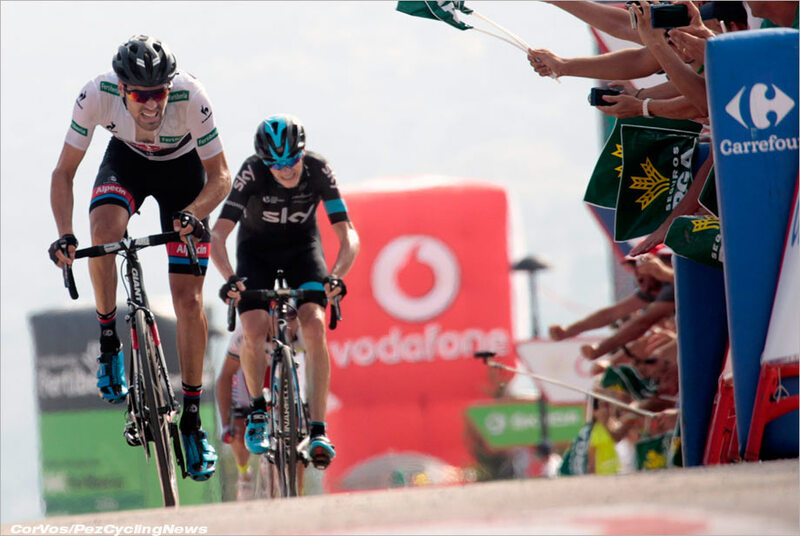 3rd on the stage and 2nd overall, Tom Dumoulin (Giant-Alpecin): "What a race Chaves did. Even better than Sunday. It didn't expect him to go so early. He went at the very right moment and I didn't have the legs to follow. I had the jersey for one day. It was nice. I would have liked to keep it longer. But it's not a disaster." Last man from the break, Steve Cummings (MTN-Qhubeka): It was hot out there but it was good. The start was quite aggressive and the breakaway took a long time to go as there was a lot of interest in making the break. We did well, everyone was covering the moves and eventually it went after about 60 or 70 kilometers. It was difficult because Gautier was up 3 minutes on GC so we didn’t really get the advantage we needed. For me it was then just a question of eating and drinking and hoping we would be allowed a bit more leeway but we didn’t really get enough. In the final I gave it a try, hoping to catch them napping or that there was a bit of disorganized chaos behind but it was still good. We can try again in a few days’ time." 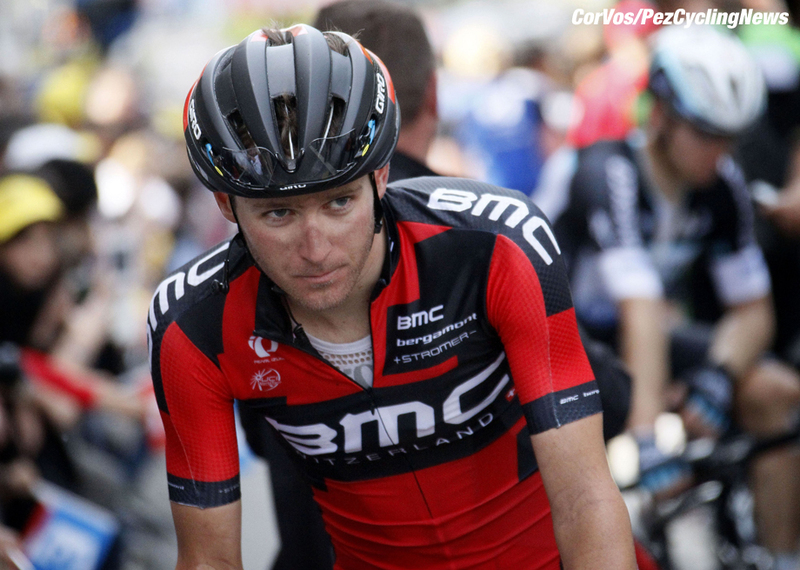 Peter Velits (BMC): "It was tough, everybody was trying, it was not so easy to get in the break. It was a big fight from the beginning to create a breakaway. We went away at a hard point and I was happy to be there. But with Gautier three minutes behind in the GC, we knew there was not a big chance. It was a pity the combination was not the best but I'm happy I was in the break." Kristijan Durasek (Lampre-Merida): "It was good to be in the break but the peloton wouldn't let us. They wanted the stage. They caught us with 10 km to go. It was a hard effort but I'll try to be good again in the higher stages. The goal for the team is still a stage win." KOM, Omar Fraile (Caja Rural-Seguros RGA): "The start of the stage was completely mad. It was going so fast. We tried to take the break but we couldn't make the right group. The heat was huge and I suffered from it, like everybody else in the peloton I think. I tried to stay safe until the end of the stage to preserve myself. Tomorrow, we'll try to go in the break agin and Pello (Bilbao) will try to play his own card in the finale. It will again be very hot. We're waiting to go past that day and then it should be a little bit milder." Miguel Angel Rubiano (Colombia): "It was war to go into the break. I tried to go for an hour and finally it went in a descent after we had passed the early stage hills. I went a little bit too late. I found myself just behind the break and then I crashed in a descent. I'm a little bit bruised by I'm used to it. Afterwards I managed to catch them and ride in the front for most of the stage." 10. Nicolas Roche (Irl) Sky. 10. Fabio Aru (Ita) Astana at 1:12. 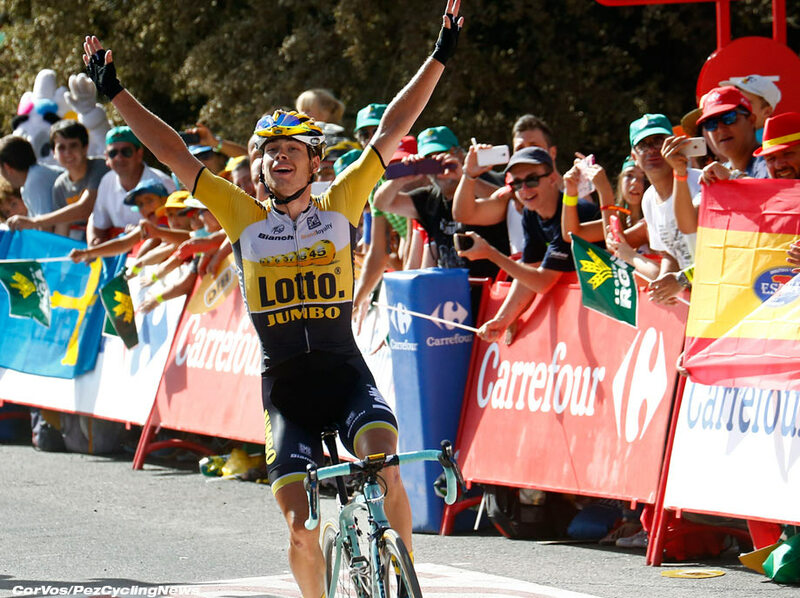 Stage 7 saw Dutchman Bert-Jan Lindeman (LottoNL-Jumbo) take advantage of the waiting game played by the Vuelta favorites in the first mountain stage to clinch a career-high victory after a long breakaway on a day when Chris Froome showed worrying signs of weakness. Lindeman won ahead of breakaway companion Ilia Eshevoy (Lampre-Merida) and Italy's Fabio Aru (Astana) the most impressive favorite, who surged in the finale to impress the rest of the GC riders, among them Colombia's Esteban Chaves (Orica-GreenEDGE) who retained his overall lead. After a nervous start, the break of the day took shape at kilometer 12 when five riders parted company with the bunch. Carlos Quintero (Colombia), Amets Txurruka (Caja Rural-Seguros RGA), Ilia Koshevoy (Lampre-Merida), Bert-Jan Lindeman (LottoNL-Jumbo) and Jerome Cousin (Europcar) saw their lead increase steadily until kilometer 30, when Chaves's Orica-GreenEDGE team-mates decided eight minutes was enough and took the reins of the peloton. At the first climb of the day, the Cat 3 Puerto de los Blancares (87km), the lead had gone up to ten minutes as Txurruka – the most aggressive rider of the day – was leading the way. The gap reached a maximum of 13 minutes with 80km to go, were Astana shared the chasing duties with Orica-GreenEDGE. Team Sky later joined the effort as the gap dropped back to ten minutes in the last 50km, but only after Movistar took their turn at the font of the bunch 35km from the line did the gap go down significantly (less than 8:00 at the Lanjaron sprint won by Lindeman). Katusha were the last to up the tempo as the lead was cut down to seven minutes with 25km left and to 6 at the bottom of the final climb. Movistar led the way in the first 8 kilometers of the ascent towards Capileira as the peloton started to split. The first prominent rider to lose touch was Pierre Rolland (Europcar). Astana reluctantly took over the reins of the pack, still trailing the escapees by 3:10 with 10 km to go. Successive attacks by Cousin and Koshevoy scattered the leading group and the two found themselves in the lead with three kilometers remaining. But Lindeman refused to bow and made up the gap one kilometer later. As the three were involved in a fierce battle for the stage win, the GC race yielded its first indications. Tour de France champion Chris Froome was unexpectedly dropped in the last 2 kilometers as Fabio Aru surged to take third place behind Lindeman and Koshevoy. Froome lost 27 seconds on the other pre-Vuelta favorites, led by Rafal Majka (Tinkoff-Saxo) as Chaves retained the red jersey. 2nd on the stage, Ilia Koshevoy (Lampre-Merida): "It's my first grand Tour, I'm a neo-professional so I'm disappointed I didn't win but I understand that you can't have everything and I'm happy with my second place. I will try to go into more breakaways and hope to have the fortune to win. I'm not good in sprints and the finale was not so steep but I just didn't have the legs. Of course I will try again." 3rd on the stage and 8th overall, Fabio Aru (Astana): “First climb finish. I wanted to see how I responded because I didn't feel well after the crash. I find it better every day. Now its time to recover for the next day. I haven't seen the standings. I just do my race. It's a beautiful Vuelta, very hard. I love racing in Spain and I always try to do well. We´ll see how it goes next”. 5th, Rafal Majka (Tinkoff-Saxo): "I'm happy with the way my team-mates set me up. I tried to attack in the last 1.5 km but Aru was really impressive when he attacked. I come really good.I'm happy to finish with the strongest guys. At the moment I feel good. But my team director told me to wait for the last week as the Vuelta is long and the last week is the most important." 6th on the stage and overall leader, Esteban Chaves (Orica-GreenEDGE): "I'm really happy and especially of the team work. I can't still believe that Tour de France yellow jerseys or world champions are looking after me. It's an important step but we must keep focused because the next few stages are difficult again. It was very hot in the last climb. It was a 40, 50-minute climb and everybody suffered from the heat. We're going to keep fighting to keep the jersey. I don't know what happened to Chris Froome, I'll have a look at the GC standings. I'm surprised he lost time because he is the Tour de France winner and a great champion." 8th on the stage and 7th overall, Nairo Quintana (Movistar): “Everybody felt about the same. Some recovered time and others lost some. I think Froome suffered with the heat, which was terrible and inhuman today. We stood the suffering well. Sometimes it's hard but I think it is possible to race in this heat. I think low temperatures are worse." 10th on the stage and 4th overall, Nicolas Roche (Sky): "Today, the weather was very dry and not everybody likes it. I like it alright. I didn't do too badly in the finale. I was always at my limits but I didn't try to attack, I above all tried not to lose time. I think that with Chris, one should not worry. Not yet. He came directly from the Tour willing to go crescendo. If he lost a few seconds today, it's not alarming." 9th on the stage, Louis Meintjes (MTN-Qhubeka): "The break went early today and then the race was pretty controlled all day before the run in to the final started. The guys looked after me all day, it was really hot so I got a lot of ice and a lot of water. In the final I just stayed with the front group and sprinted at the end. The climb was pretty fast and there was a big group going up there but I think the heat was the deciding factor. You could see some guys were just tired before they even got the climb so the heat was a big factor today. I had good legs though so I hope it continues." Dani Navarro (Cofidis): “It's very hot. Today with the headwind, not too much, but in the end, in the last climb without wind, it was hard. I think Astana is the stronger team." Kenny Elissonde (FDJ.fr): "I did what I could. There was a hard pace in a stretched peloton and some flat sections. I tried to hang out there. I don't know if I'm getting used to it but I found there was more air. The more we go in this Vuelta, the better we'll stand the heat. Now I will need a little bit of luck to go into the right break. I lost 1:50 I think. I got dropped with 2 km to go and in these cases, you lose time quickly." 10. Domenico Pozzovivo (Ita) AG2R-La Mondiale at 1:19. Youth keeps ruling in the Vuelta with the stylish stage victory of 23-year-old Jasper Stuyven (Trek) in Murcia at the end of Stage 8, Riddled with crashes and incidents. The promising Belgian overpowered Pello Bilbao (Caja Rural-Seguros RGA) and Kevin Reza (FDJ.fr) in a sprint without some of the leading favorites. A massive crash 50km from the line forced Dan Martin (Cannondale-Garmin), Tejay Van Garderen (BMC), Nacer Bouhanni (Cofidis) and Kris Boeckmans (Lotto Soudal) out of the race. And arch-favorite Peter Sagan was hit by a motorbike 10 km from the line, crossing the line with his jersey and shorts in tatters. Colombia's Esteban Chaves (Orica-GreenEDGE) survived the ordeal to retain his race leader's red jersey. After a nervous start, it took 35km for six riders to escape the bunch. Iljo Keisse (Etixx - Quick-Step) and Jimmy Engoulvent (Europcar), already involved in long breaks in this Vuelta, were joined by Alex Howes (Cannondale-Garmin), Tom Van Asbroeck (LottoNL-Jumbo), Mattia Cattaneo (Lampre-Merida) and Angel Madrazo (Caja Rural-Seguros RGA). Their lead topped at 4:30 after 60km. A major pile-up 50km from the finish line in the first passage through Murcia, involving nearly 30 riders and some of the peloton's big names like Dan Martin (Cannondale-Garmin), third overall, BMC leader Tejay Van Garderen and French sprinter Nacer Bouhanni (Cofidis). The most seriously hurt was Belgium's Kris Boeckmans (Lotto Soudal) who was taken to hospital and was unconscious. It was said later that the race doctor probably saved his life. The crash split the peloton trapping the top two riders in the GC, race leader Esteban Chaves and Dutchman Tom Dumoulin (Giant-Alpecin) some 20 seconds behind the front split, they fought their way back. On the first ascent of the Alto de la Cresta del Gallo, the leading group lost half of its members and only Howes, Catteano and Madrazo carried on. Howes then went solo but he crashed in the descent. The race remained extremely nervous with countless attempts, notably led by local heroes Alejandro Valverde (Movistar) and Luis-Leon Sanchez (Astana). With 12 km to go, France's Kenny Elissonde tried his luck, quickly joined by Alberto Losada (Katusha) and Jose Goncalves (Caja Rural-Seguros RGA). The three worked well but were finally reeled in with 3 km to go as the stage was set for the final sprint. It took place without Peter Sagan (Cannondale-Garmin), who crashed at the 10-km mark after being hit by a motorbike. The green jersey holder still made it to the finish line, although he was badly injured and would not start on Sunday. In the finalé, after a solitary surge by Adam Hansen (Lotto Soudal), Jasper Stuyven jumped on the wheel of Giovanni Visconti (Movistar) and led for most of the last 250 meters to win ahead of Pello Bilbao (Caja Rural-seguros RGA) and Kevin Reza (FDJ.fr). 2nd on the stage, Pello Bilbao (Caja Rural-Seguros RGA): “I had great feelings. From the beginning we planned to save Jose Goncalves and myself for the finale. This kind of finales suited us very much. Jose proved he was the strongest. He tried on his own and then he helped me in the sprint. It is a pity, but they passed me on the line. We are having a very good presence, not only in the breaks but where the race is going on, we made an outstanding qualitative leap. We are competing with the best teams in the world." 3rd on the stage, Kevin Reza (FDJ.fr): "Before the finale, my legs were heavy. I can't be disappointed by a third place in the Vuelta but it's a little frustrating because I feel I could have overtaken the guys in front but the legs were too heavy. It's something I've already noticed in the Giro. I always struggle in the beginning of the Grand Tour. Afterwards it's getting better and better. And Kenny also showed today how good the team spirit was." Overall leader, Esteban Chaves (Orica-GreenEDGE): "After a roundabout 50 km from the finish, two riders from Lotto-Soudal touched wheels and crashed. It seems that Boeckmans is seriously hurt. I hope he will be alright. I found myself on the tarmac but I was not hurt, it was only minor bruises. The life of a rider is made of those. Neil Stephens kept talking to us in our earphones, it kept us calm. He has a knack of knowing what to say to keep me calm. I focused on my team-mates and that's how I managed my way back into the peloton. It's the way I'm going to keep the jersey. The longer the better…"
Break rider, Kenny Elissonde (FDJ.fr): "It was a day to try something. It might not have looked the most ideal stage for me on paper but if you wait for the course to be ideally suited, you never attack. I really believed in our chances because I was with two strong guys, especially the Katusha guy. But I will try again. That's the way I and all of the team want to perform in this Vuelta. And it was also a lot of fun." Escapee, Alex Howes (Cannondale-Garmin): "I just decided to give it a try. Unfortunately, as you could see, I crashed. I was very slippery and narrow. Of course I'll try again if I have a chance. We're a team of young and motivated riders. We'll try again but it's not as good without Dan." 2nd overall, Tom Dumoulin (Giant-Alpecin): "Another day gone. And it was not a good day. I was involved in the crash. It was chaos there and it took me a lot of energy to make it back. Then in the last climb I tried to do my job to help John (Degenkolb) but he was not there. I don't know what happened to him, whether he crashed of got dropped. The roads were narrow and slippery, it was a hard day." Tinkoff-Saxo DS, Tristan Hoffman: "We don't really know what happened. We know that a motorbike hit Peter from behind and brought him down. But we don't know what bike or who it was. Things like that happen. We would not like them to happen but they do. All we're hoping for is for Peter to be alright. He lost a lot of skin. I can't tell you if he'll start tomorrow because I don't know." KOM; Omar Fraile (Caja Rural-Seguros RGA): “I had the legs in the end so I tried to go in the breakaways. When Gonçalves was in front, I tried to follow the attacks to stop them. In the finale, Pello Bilbao got second. We were so close. I hope we find the victory. I nearly got caught in the first crash. I braked, I jumped over and I avoided it. There were many riders down and I think that someone was hurt. I don't want to get carried away by the jersey because next week we have many climbs that will really determine the winner of this jersey. Tomorrow I will try to break away, but only to try and retain that jersey." Didier Rous (Cofidis team director): "We're waiting for the results of the X-ray checks but we already know that Nacer Bouhanni dislocated his wrist which was put back into place. It's a crazy season for him. He crashed in all the races that were his goals this season, the French championship, the Tour de France and now the Vuelta." 6th overall, Nairo Quintana (Movistar): "Luckily we avoided the major crashes even though Jose Joaquin Rojas is a little scratched. The goal today was not to lose time and I'm really looking forward to the mountains. I can feel the fatigue from the Tour because it's the first time I double up Tour and Vuelta. I live day by day." 4th overall, Alejandro Valverde (Movistar): "Everybody knew that this stage was dangerous. I heard about the crash in which Dan Martin and Van Garderen were involved but I didn't see it. I was riding in the front. We were unlucky ourselves later with the crash suffered by Jose Joaquin Rojas who was our designated rider for the stage win. For now we must keep our fingers crossed, let the days pass and not lose time." 11 Kris Boeckmans (Lotto-Soudal) serious concussion. Had to be taken to hospital in Arrixaca. 156 Daniel Martin (Cannondale-Garmin) upper limbs trauma. Had to be taken to hospital in Arrixaca. 38 Tejay Van Garderen (BMC) upper limbs trauma. Had to be taken to hospital in Arrixaca. 51 Nacer Bouhanni (Cofidis) upper limbs trauma. Had to be taken to hospital in Arrixaca. 144 Simon Gerrans (Orica-Greenedge) minor facial trauma. Stays in the race. 216 Boy Van Poppel (Trek Factory) upper limbs trauma. Under treatment and stays in the race. 214 Frank Schleck (Trek Factory) upper limbs trauma. Under treatment and stays in the race. 10. Mikel Nieve (Spa) Sky at 1:21. Tom Dumoulin (Giant-Alpecin) claimed back the Tour of Spain's red jersey with a brilliant display of strength on the Puig Llorença climb at the finish of Stage 9, beating Chris Froome (Sky) and Joaquim Rodriguez (Katusha) to the line. The Dutchman, who held the Vuelta lead for one day in Vejer de la Frontera, made it back to the top thanks to three blistering attacks on the final ascent, dropping most of the favorites, including red-jersey holder Esteban Chaves (Orica-GreenEDGE), who lost nearly a minute Dumoulin. Two stage winners did not start: Belgium's Jasper Stuyven (Trek), with a wrist fracture, and Peter Sagan (Tinkoff-Saxo), bruised after his crash in stage 8. The day's break was: Nikolas Maes, Pieter Serry and Maxime Bouet (Etixx-Quick Step), Geraint Thomas (Sky), Lorrenzo Manzin (FDJ.fr), Mattia Cattaneo (Lampre-Merida), Yohan Bagot (Cofidis), Maarten Tjallingii (LottoNL-Jumbo), Omar Fraile (Caja Rural), Tony Hurel (Europcar), Danny Van Poppel (Trek), Pavel Brutt (Tinkoff-Saxo) and Songezo Jim (MTN-Qhubeka). Those 13 riders were joined by Alexis Gougeard (AG2R-La Mondiale) after 42 kilometers. At 34 Kilometers, a massive pile-up at the front of the bunch sent some of this Vuelta's leading names to the floor. Alejandro Valverde (Movistar), Fabio Aru & Mikel Landa (Astana), Samuel Sánchez (BMC), Domenico Pozzovivo (AG2R-La Mondiale) and John Degenkolb (Giant-Alpecin) were among the riders involved but none were seriously injured. Thomas Degand (IAM Cycling) called it quits after 55km. The lead of the 14 reached a maximum of 5:40 after 40km before Joaquim Rodriguez's Katusha team decided to maintain it around four minutes. 50 km from the finish line, Movistar took over at the front of the bunch and the gap instantly diminished. It was down to 2:30 by the first ascent of Puig Llorença, on which the leading group fell apart, leaving only KOM Fraile, Cattaneo, Bagot and Serry in the lead. Fraile was first at the top and strengthened his polka-dot jersey lead. On the descent, the four were caught back by Thomas and Bouet and further down by Jim, Brutt and Tjallingii, who won the day's sprint in Bahia de Javea. At the 15km mark, Katusha had brought the pack back within a minute of the nine escapees. With 10km left, Bouet and Brutt parted company with their companions and were later joined by Thomas. Serry, Bagot and Cattaneo followed some 15 seconds back. The six regrouped but were reined in by the pack on the final climb. The big fight started, Valverde and Quintana trying to surge before Dumoulin launched his first attack, aided by Jose Goncalves (Caja Rural-Seguros RGA). Chaves first managed to pull him back, but the Dutchman attacked again with 2km to go, this time leaving Chaves in his wake. Chris Froome (Sky) raised the tempo with Rodriguez on his heels, and jumped in characteristic fashion looking set for stage victory when a last gasp effort by Dumoulin allowed him to silence the Briton and earn a well-deserved victory and the overall lead. Stage 9 winner and overall leader, Tom Dumoulin (Giant-Alpecin): "I felt very good during the stage, unlike yesterday when I did not have the best day, so I wasn’t really expecting it. But the stage worked out surprisingly well. My tactic for the final climb was to attack on the flatter part and hang on the steeper part. I could never have imagined that I could win a stage like this, but I’m in the form of my life. I’m really happy with the first week and my form, as I didn’t know exactly what to expect at this Vuelta. I’m proud to be back in the leader’s jersey now, and I will see day by day how it goes from here. We are not on the big climbs yet, but my climbing is improving and I’m climbing well." 2nd on the stage and 8th overall, Chris Froome (Sky): "I thought I had it for a second there. But Dumoulin showed incredible form in the stage. Hats off to him. He's a young rider with a bright future ahead of him. The guys did a fantastic job for me today. Geraint, Nico Roche, Sergio Henao, Mikel Nieve, the four climbers at the front of the race bringing me to the climb in the best position. Thanks. I really gave everything. I rode a little conservatively at the bottom to try to save some strength for the finish. It was not enough but to be honest I'm really happy to be where I am." 3rd on the stage and 2nd overall, Joaquim Rodriguez (Katusha): "It was a very fast climb from the start when Valverde attacked full gas. I tried as hard as I could and I didn't really expect to be so good. I was really surprised by Chris Froome, the way he rode today after not being so well the other day. But I was above all impressed by Tom Dumoulin. He was very, very impressive." 4th on the stage and 6th overall, Fabio Aru (Astana): "The team helped me a lot, did a great job to set me up at the start of the climb. It went full gas from the start and it was very hard but I think I limited the damage pretty well." 7th on the stage and 5th overall, Alejandro Valverde (Movistar): “I did the best I could. I thank the team for supporting me all the time. It was very difficult. I tried to surprise them at first to see how the legs reacted, because in the first climb I did not feel ok. I'm happy, I have not given up much time and now I will have radios to see if there's something wrong. I’m not one to make excuses but we now need to evaluate the situation. We know how Froome rides, he always does the same. He hangs on, then comes, then goes, it is his way of racing. " 3rd overall, Esteban Chaves (Orica-GreenEDGE): "I'm tired and disappointed. I lost the jersey 500 meters from the finish. But Tom Dumoulin did an unbelievable ride today. He is a really strong guy. I want to say congratulations to him. He won the stage and the jersey, that's unbelievable. I tried, I gave my best effort. I said on the first day when I won that I wanted to leave my skin on the road. That's what I did today. I want to thank the team, the staff. We'll continue to try and keep going." KOM, Omar Fraile (Caja Rural-Seguros RGA): "It was a really difficult stage with the heat and the peloton who never let us any advantage. We knew that a five minute lead was not enough to go all the way. I fought to take points for the mountain. Now I'm really into the battle for the polka-dot. I would love to win it. But as I've said since the start, the first step is to get to Andorra and then we'll know better what it is possible to do." Break rider, Yohan Bagot (Cofidis): "I believed in our chances when we were 5:50 up at the start but when I head that the Katusha were chasing, I knew it would be difficult. We climbed the first passage full gas. I didn't really know the gaps so I was hoping that we could make some time up and that the peloton had given up. But when I saw we were only 1:15 up one kilometer before the climb, I realized it would be complicated. I wanted to get to the bottom with a little lead to see what I could do. But when I looked back, they were all there. Mentally I'm fine. My role was to protect Nacer and that was fine by me. Since he crashed, it's a different ballgame. I can go in the breaks. That's what I did today." 10. Louis Meintjes (RSA) MTN-Qhubeka at 0:34. 10. Domenico Pozzovivo (Ita) AG2R-La Mondiale at 1:52. Team Katusha’s Alexander Kristoff took another WorldTour victory by winning the one-day classic Grand Prix Ouest France Plouay. In a sprint from some 50 riders, Kristoff was the fastest, beating Simone Ponzi (Southeast) and Ramunas Navardauskas (Cannondale-Garmin). For Kristoff it is his 20th victory of the 2015 season. On the 9th and last ascent of the Côte de Ty Marrec (1500 m, 5,5 % average gradient), with 4km to go, the break of three riders: Alexey Lutsenko, Tim Wellens and Silvan Dillier was caught. 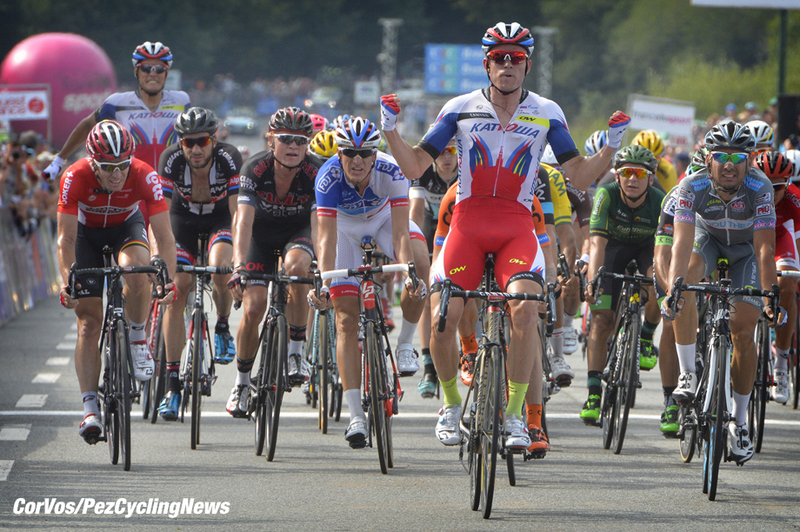 Greg Van Avermaet and Matti Breschel launched a searing attack, but Katusha chased them down. And then it was time for Jacopo Guarnieri to start his sprint for team leader Alexander Kristoff. The long 217km classic consisted of eight laps of 26,9 kilometer and one extra lap of 13,9 km. Five riders were able to stay in front most of the race but when the real final began, there story was over. Then Team Katusha, with Sky and Etixx-Quick-Step controlled the race. Only Lutsenko, Wellens and Dillier caused some panic in the main group, but in the end all turned out well for Katusha. Race winner, Alexander Kristoff (Katusha): "Everything went how we planned it. Of course we had to gamble a bit. We could not do all the work to catch back the three guys in the front, but we were present and saved forces for the last kilometer. In the sprint we really had control over the situation. I need to thank all my teammates. In the end we started here with three guys coming back from an injury but they did a marvelous job for me. No need to say that I am very happy with this prestigious win. The Canadian races are a bit too hard for me, but it will be the perfect last preparation for Richmond." Katusha DS; Torsten Schmidt: "It was amazing how the six teammates of Kristoff worked all day. And then in the last lap Marco Haller and Jacopo Guarnieri did the perfect job. For them it is also nice when the leader finishes the job. I am impressed by them, but most by Alexander Kristoff himself. It is amazing how much he is a training animal. He is so focused. His season is not over yet." 10. Magnus Cort Nielsen (Den) Orica-GreenEDGE. 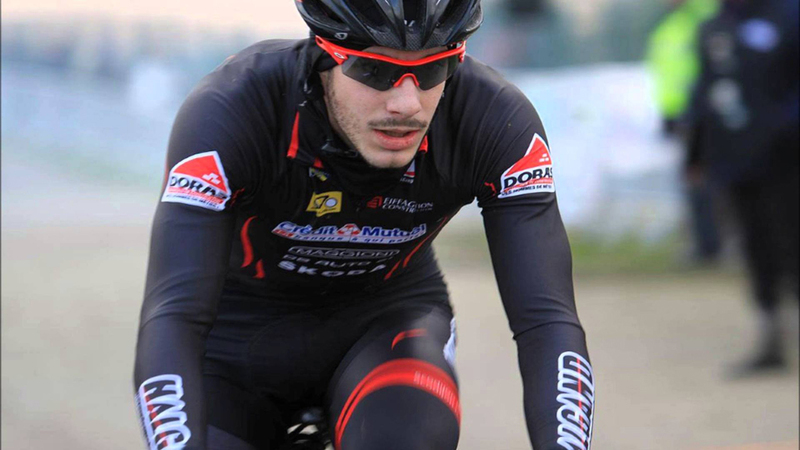 Peter Stetina has signed a contract for 2016 with Trek Factory Racing. The 28-year-old American joins the team as a support rider for the team’s overall ambitions in stage races, but also with a personal focus on the week-long races in North America. Stetina fractured his right tibia, patella and five ribs in a crash at the Vuelta al Pais Vasco in April when riding for the BMC Racing Team. He made one of the fastest recoveries on record to come back at the Tour of Utah and went on to support his team’s overall success at the USA Pro Challenge last week. Stetina: “I’m stoked about this. It’s a good move for me, I think. Because of my injury my position on the transfer market was a bit different. Teams don’t want "damaged goods", you know. But Luca (Guercilena) has been in close contact with me all along the recovery. He was very supportive." "We are very excited about Peter coming to our team,” says General Manager Luca Guercilena. "He will be a very valuable rider for us. I remember him as a key support rider for Ryder Hesjedal, who’s also joining us next season, when he won the Giro in 2012. Besides this, I think he has proven to be strong when given his own chances and we plan to have him at the American and Canadian races to defend the overall." Stetina continues: "I really enjoyed my time with BMC, where I have spent two great seasons, but TFR was the right move for the next step in my career and comeback. I’m really happy to join the team. It's one of the top set-ups in America and in the world. I think it’s going to be a great move for my career. I’m ready for Stetina 2.0." “In terms of goals and ambitions, I had a very nice chat with Luca (Guercilena). We still need to figure out details, of course, but as far as personal and team goals go, I would support Bauke (Mollema) and Ryder (Hesjedal) in their races and then also target the American races as a personal goal." “Finally, I’d like to brush up on my time trial skills. I was twice the U23 National Champion and sixth at the World Championships. Since I turned pro I haven’t really progressed in that area and it's awesome to see someone like Bauke Mollema not only defend his overall position since he joined Trek, but even move up in the GC, instead of losing places. 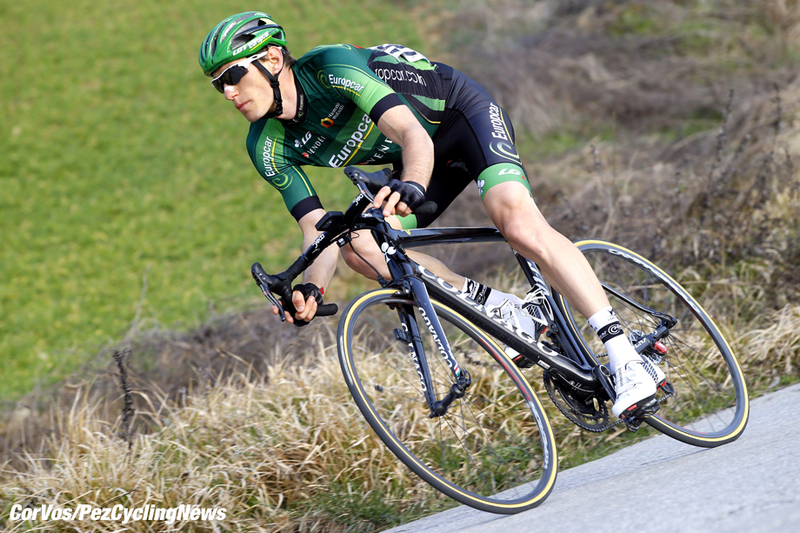 I’m convinced Trek can help me improve my TT position and become a better time trialist"
Cannondale-Garmin Pro Cycling today announced that French rider, Pierre Rolland, will join the team in 2016. Rolland, a talented climber, has achieved an impressive list of palmarés including top-ten finishes (2011, 2012, 2015), stage wins (2011 Alp d’Huez and 2012 La Toussuire) and Best Young Rider (2011) at the Tour de France, and 4th Overall at the 2015 Giro d’Italia. Jonathan Vaughters, CEO of Slipstream Sports and Cannondale-Garmin Pro Cycling, said that Rolland's riding style reminds him of Thierry Claveyrolat, one of his favorite riders of all time due to that riding style, and is capable of winning the Tour de France Polka Dot Jersey: “Pierre is a rider that shows determination, style and panache year after year. He rides in the style of big gear, head up and always attacking. That style is something I respect and admire about Pierre. I believe that for all of his talent, he still has untapped potential. We hope to bring some work in aerodynamics and a bit of fresh air to help him maximize that potential, while retaining that panache and style that make him the great rider he is. He is a rider who I believe can one day win the Polka Dot jersey and is an exciting addition to our 2016 line-up.” Looking ahead to the 2016 roster as a whole, Vaughters added: "We have an exceptionally talented roster of young riders; what we need to continue to build is leadership for the young guys by giving them experienced riders that they can learn from to better harness their own talents - and Rolland brings that in spades." The 29-year-old rider's talent is diverse, with his palmarés demonstrating aptitude for the one-day races and general classifications. His one-day race victories include 2014 Giro di Lombardia, 2013 Liège - Bastogne - Liège, and the Japan Cycle Cup Road Race in 2010. Martin's stage race success includes being the overall victor at the 2013 Volta Ciclista a Catalunya, as well as the 2010 Tour de Pologne. Martin is also a two-time Tour de Pologne stage winner, and he won the mountainous 9th Stage of the 2013 Tour de France, which arrived in Bagnéres de Bigorre, as well as the 9th Stage of the 2011 La Vuelta a España, which arrived on the Covatilla summit. Trek Factory Racing is pleased to announce that it has reached an agreement with Julien Bernard, who is currently racing with the team as a stagiaire. Bernard joins the team on a two-year deal. Bernard, 23-years-old, joins the pinstriped team from SCO Dijon (France) and has a bachelor’s degree in technical sciences in sports. He was offered a position as stagiaire with Trek Factory Racing after scoring wins at the Tour Nivernais-Morvan, Châtillon-Dijon and the Tour du Pays Roannais. At the Tour of Utah Bernard rode in support of Fränk Schleck’s GC aspirations. One week later, at the USA Pro Challenge in Colorado, he was allowed to defend his own chances and finished a remarkable tenth overall, 2 minutes and 14 seconds behind overall winner Rohan Dennis (BMC Racing). Taking the next step is what motivates Bernard, who is the son of ex-pro and 3X Tour de France podium laureate Jean-François Bernard. Bernard: “I am very happy with the trust that the management of the team places in me. My ambitions are to support the team goals as much and best as I can and to gain experience, in particular in WorldTour races. I want to keep progressing as a rider and I am prepared to work very hard for this." Saturday saw a lot of crashes in the Spanish Grand Tour, many riders finished the day in hospital. Alex Howes was one of the luckier riders and got away with some scratches. It could have been much worse. Who of us has not had the feeling of over cooking a bend?